Home › How Much Food Stamps Will I Get? How Much Food Stamps Will I Get? 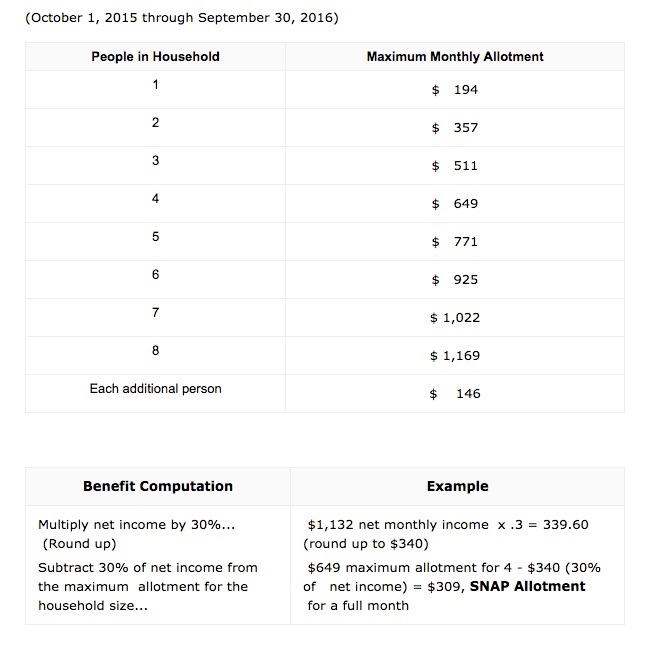 How Much SNAP Benefits Will My Family Get? Use the food stamps calculator below to determine how much allotment you will receive. Food stamps allocation is based on a number of factors. Once you are approved, the amount you will receive depends on how many people are in your household and the net monthly income of your household. There is a simple calculation: The net monthly income of the household is multiplied by .3, and the result is subtracted from the maximum allotment for the household size to find the household’s allotment. Where does the .3 come from? This is because households that are receiving Food Stamps (SNAP Benefits) are expected to spend about 30 percent of their resources on food. So, now that you know how the allocation is calculated, here is the current chart showing allocation by number of people in a household and the maximum allotment in each category. How Much Food Stamps Will I get if I am Pregnant? How Much Food Stamps Can I get If I am on Social Security? How Much Food Stamps Can I get if I am on Unemployment? How Much Food Stamps Can I get if I have a Job?